This is the Map-making section, where we will be constructing the layout of our region. The work we do will range all the way from making an entire map of the region to constructing the individual routes and towns, in addition to making the interiors of buildings and caves. If you have an idea for an area that you want to include in the story, then it's best if you first put your idea in the Plot section so we know how to incorporate it into the plot. 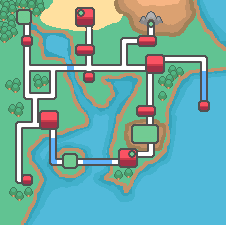 Then, you can post it here and maybe someone can submit a sketch of a map to send to the Spriting section. As many other games do (except Black and White, curse you NYC), our region will be based on a location in Japan. I just looked at a map of Japan and cropped out a nice location, then made a map out of it. - The town at the bottom-left is the player's hometown. 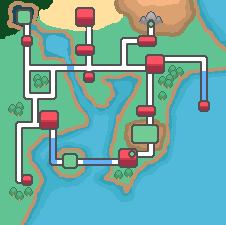 - The cave on the other side of the bay is Victory Road, and the following blue location is the Pokemon League. - The red area surrounding Pokemon League is the Battle Frontier. - The mountain at the top-right is where the main legendary encounter will occur. - You will notice the first town from your hometown has two black dots. This is because two gyms are located here. I actually really like that map. Nice job! Ferrety wrote: I actually really like that map. Nice job! Thank you very much, Ferrety. I might make a higher-quality version sometime. You can use this as an example for graphics for your final copy. I know I'm posting on everything, but I wanted to say I want a Egyptian-temple like area, I based a Heracross evolution after an Egyptian god and Ferrety's Bug/Ghost guys I think would look good in there. I also made somewhat of a vague idea for an evolutionary line of Heiroglyph Poke'mon (Keestregal, *insert Hawk Poke'mon's name here*, Falcoperial). The thing about an Egyptian Temple is that there would need to be Pokemon specifically designed for it. The best locations are the ones that don't force us to make specific Pokemon. Also, if we do decide to use evolutions of old Pokemon, we wouldn't go and put them in the wild. They're too rare and strong. Ferrety wrote: The thing about an Egyptian Temple is that there would need to be Pokemon specifically designed for it. The best locations are the ones that don't force us to make specific Pokemon. Also, if we do decide to use evolutions of old Pokemon, we wouldn't go and put them in the wild. They're too rare and strong. I was more thinking that a Heracross would have to level up in the Pyramid to evolve into Kheprecross. I'd love to see it when it's done. I'll do that now, I've made the roads and cities, I have nothing better to do. That's very good. I never felt motivated enough to make mine. Although, the top-left corner is supposed to be a swamp, not a mountain. Swamp. Gotcha. I'll do that now. I'd imagine a swamp would have a lot of trees around it and maybe dark-green landscape. I've tried, but dark green looks absolutely awful. I've just covered the area with trees, maybe we could have a forest there? Perhaps where Celebi is, post-game? Yeah. Just to get this boulder rolling. I think we need a theme for our town names. Kanto had a color theme, Johto had a tree theme, and Unova had a cloud theme. By the way, the swamp looks fine. Note: Most of the things I published aren't mine. I founded them in internet. Sorry for the double post, but I found this. I found it in one of my archives. 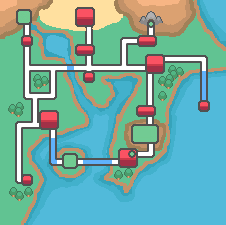 It is basically places from Gen 3 modified with 4th gen art. Oh yeah, I see. Brilliant, it looks great.